We are not asking for a halt to all construction. We are not asking for a halt to all renovation. Our request is clear and precise. Our insistence for a moratorium is a heartfelt plea to the Department of City Planning, our Community Board, our Councilman, NYC Council, our Borough President and of course, our Mayor begging them not ignore or abandon us. We want them to hear that there are thousands of hard working, tax paying, Carroll Gardens residents whose voices and concerns are neither frivolous nor inconsequential. Projects, like 360 Smith Street, and others of their ilk, in their various stages of planning or execution, have awakened angry feelings in the hearts of many of our residents. Many of us want to know how these out of scale and context projects could even be considered for our area. What type of strain will these very large apartment complexes put upon our already pushed to the limit infrastructure? How will the pre, during, and post-construction periods affect the safety of our homes and more importantly, the quality of all of our lives? Are these not the questions that should be asked and more importantly, answered by City Planning, BEFORE projects, as large as these, in a low rise, mainly nineteenth century built neighborhood such as ours, are approved? 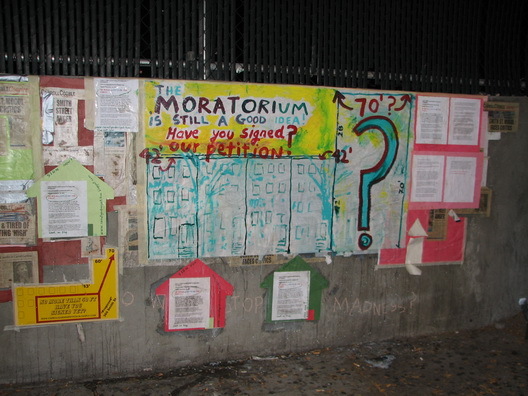 Has a situation arisen yet where a moratorium, through the ULURP process has been granted in NYC? No, not yet. Is it time? We believe it is...While the frenetic and often hazardous pace of construction continues, as stop work orders mount and often dangerous damages/conditions develop to the neighboring properties of construction projects all around the city, CORD asks the Department of City Planning and all of the other ULURP procedure involved agencies and officials to allow us the latitude to decide our neighborhood's future. Let us help you plan our tiny corner of the city. We do not pretend to know all, but we are thousands of Carroll Gardens residents and we know our neighborhood. Surely we are capable of making an informed decision on the direction that would be best for our community. Guide us. But, please, let us work with you.